Steve Baukol, District 4 permit technician, died Sunday, Oct. 26, in Rochester, Minn., after a three-year battle with cancer. Baukol, 51, worked in District 4 for 16 years in maintenance and the permits office. Friend and MnDOT colleague Brian Bausman said Baukol had the respect of his co-workers and his customers. Working in permits, he was highly regarded by utility companies for the service he provided. Outside of work, Baukol enjoyed golfing, fishing and lake activities, but family was number one. Baukol was especially excited about becoming a grandfather to Beau recently. He was quick to show Beau off to his friends and colleagues each time he brought a new photo to the office. He also had an incredible memory. Colleagues will remember his positive attitude, his kind smile and outgoing laugh. “You could always tell where he was from his laugh,” Bausman said. Baukol is survived by his wife, DeAnna; three children, Amy (Rick Sr.) Zertuche of Fargo, N.D., Sarah Baukol of Willmar and Tyler Baukol of Valley City, N.D.; and one grandson, Beau Zertuche and one step-grandson Ricky Zertuche, Jr.; parents Peder and Timmie Baukol of Starbuck; sister, Suzan (Bruce) Holten of Starbuck; brother, Peder (Pat) Baukol of Ham Lake. Visitation will be held at the David Donehower Funeral Home in Detroit Lakes at 4 p.m. Friday, Oct. 31. A prayer service and time of sharing will begin at 6:30 p.m. The funeral will be held at Trinity Lutheran Church in Detroit Lakes at 11 a.m., Saturday, Nov. 1. There will be visitation one hour before the service. Editor’s Note: This is one in a series of articles showing how offices are re-thinking processes in order to support MnDOT’s Wildly Important Goal of Enhancing Financial Effectiveness. The oversize/overweight permit section of the Freight and Commercial Vehicles Operations office issued approximately 90,000 permits last year. The section continually looks at its business processes to see how it can more effectively serve its customers and more efficiently handle the increasing need for permits. 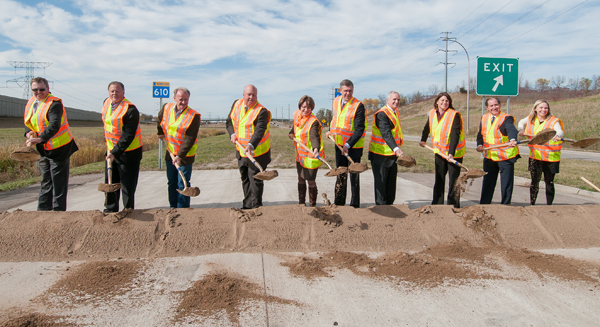 When MnDOT started working on Wildly Important Goals and Other WIG Supporting Activities, the permit section leadership team knew incorporating its current methods of process improvements into the new WIG format goals would provide a helpful and consistent structure to the section’s processes. In summer 2013 the permit section upgraded its online permit system. Companies transporting loads that exceed legal sizes and/or weights need a permit to legally travel on interstates, U.S. and state highways. The permits contain detailed information about the carrier, vehicle configuration, load, date and time of travel, and specific route. The permit team reviews most permit applications that are primarily requested by customers online. Some applications are reviewed automatically and issued through the online permitting system. Team members review the applications for accuracy and completeness. They verify that the route requested on the permit is free of construction projects or other constraints, including bridge height issues. The permit section’s WIG was to increase the percentage of customers who can revise their own permits online from 0 to 30 percent. The WIG was chosen because it would reduce extra tasks for permit technicians and save customers time and money. It was also chosen because current efforts were already focused on de-bugging the software and the WIG would benefit the office and customers. Senior technician Barb Capistrant used detailed spreadsheets to determine the office revised approximately eight permits a day. The majority of the revisions were carriers needing a license plate change. Armed with that knowledge and knowing the design specs of the new permitting system, the leadership team knew that when working properly, customers could use the new online system to do their own revisions, such as a license plate change. Rob Holschbach and Debbie Starr, senior technicians, Ted Coulianos, permit section supervisor, and Shelly Meyer and Roger Clausen, of the project development and administration section of OFCVO lead the WIG initiative. “We went from doing eight permit revisions a day to two,” said Carli. Coulianos said using the WIG format was a good way to focus the permit section’s ongoing efforts while continuing to improve processes. “We are consistently doing process improvements. We always need to think things through and look for ways to improve and give better customer service,” he said. One of OWSA was to design a way to communicate with customers through the online permit system. This was accomplished by designing templates of common terminology so all technicians use consistent messaging with customers. Another active OWSA is to develop a training manual to reference past and present decisions. This will improve permit accuracy and serve as a guide for current and new team members when a permitting situation or question arises that the technicians don’t usually see. The leadership / WIG team also holds bi-weekly “20-minute huddles” as a training session and way to communicate with team members. Another OWSA is auditing past permits. The ongoing audits help improve the overall permitting process. “We want everyone on the team to understand how we do things and why, not just because it’s always been that way. By auditing a percentage of our permits, it helps us to make sure we are all doing things the same way and that our customers are getting an accurate credential,” said Carli. The goal is to reduce inconsistencies on permits by at least 50 percent by spring 2015. “We are receiving positive feedback from our customers. They see our increased efforts for good customer service as well the improved functionality of our permit system,” said Carli. EFE updates and materials can be found at http://ihub.dot.state.mn.us/efe/. 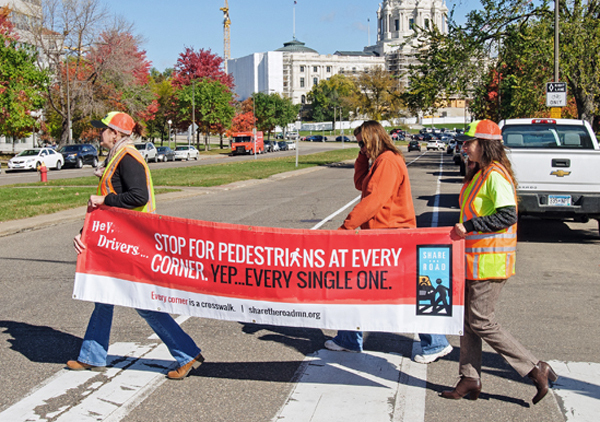 Financial effectiveness and how MnDOT supports it was the focus of this year’s Metro Employee Days earlier this month. Nearly 900 employees visited the 19 booths hosted by the district’s functional groups. Each booth displayed information about the group’s work and its contributions to the department’s financial effectiveness. Many of the groups also highlighted current Wildly Important Goal activities and displayed scoreboards charting progress. 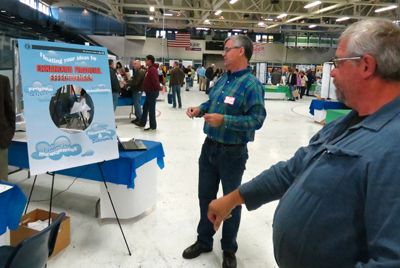 Visitors to the Metro Management Team booth were invited to submit ideas on how MnDOT could operate in a more financially effective way. Suggestions such as “Be more careful with overtime” or “Stop programming pavement projects by worst first,” were written on paper, folded into paper airplanes, and tossed toward a target. Each suggestion was entered into a prize drawing. Employees submitted nearly 200 suggestions, which are being distributed to the appropriate work areas for further consideration. Scott McBride, Metro District engineer, was pleased by the number of responses and quality of the suggestions. “As expected, the best ideas come from the people who are closest to the work,” he said. Open enrollment for State Employee Group Insurance Program is Oct. 31 to Nov.13. Open enrollment starts Oct. 31 for employees who want to make changes to their benefits. Open enrollment will continue through Nov. 13. Changes in this year’s plan include a $500 carryover for the pre-tax medical/dental expense accounts, less than a 2 percent increase in dental plan premiums, primary care clinic changes and a cost for the Advantage Health Plan single premium. Single insurance cost will be $26.26 per month. Family cost will be $179.18 per month. This year’s open enrollment allows employees to change their medical insurance carriers and add or drop dependent or family coverage. Employees also may adjust coverage for long-term disability, child life insurance, flexible spending accounts, and the Manager’s Income Protection Plan. Employees currently participating in the flexible spending accounts and pre-tax plans for medical, dental, dependent care and transit must re-enroll for 2015. Some benefits are not open every year. For example, dental benefits are not open for changes this year. During open enrollment, employees also can sign up for a StayWell Health Assessment, which includes completing a personal health assessment and accepting a health coach call to receive $5 reduction in office visit copayments in 2015. Register for an account with StayWell now and complete the personal health assessment during the open enrollment period. The State Employee Group Insurance Program website also has additional information. For more information about open enrollment, contact Deborah Staples, 651-366-3405; Pam Horwath, 651-366-3376; or Connie Eystad, 651-366-3398. Employees may also contact their district human resources offices or SEGIP for more information. 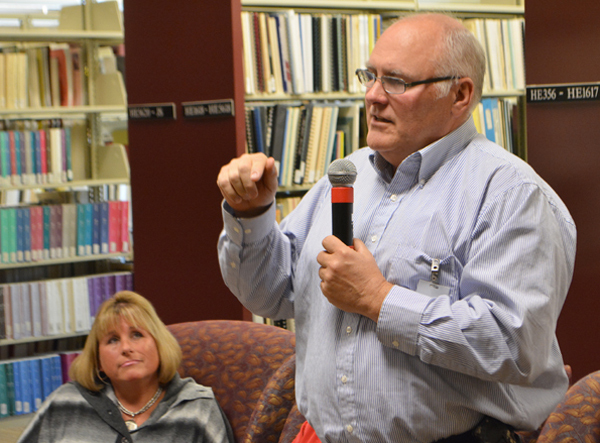 Bob Vasek, maintenance operations engineer, describes his job simply as supporting districts’ maintenance operations. One part of that involves working with the Department of Administration's Materials Management Division to develop specifications for statewide maintenance materials and services contracts. Vasek manages about 20 contracts, including salt, aggregates, bituminous materials, sod, deicers, pesticides, guardrail posts and culverts. The contracts structure the best cost and delivery of commodities used throughout the state. “Anything we construct also has to be maintained. These contracts help put things in place to help districts manage their supplies and operations,” Vasek said. 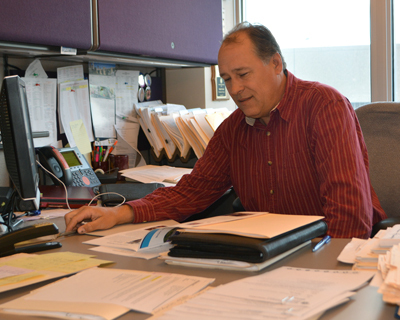 Vasek has worked at MnDOT for 28 years. 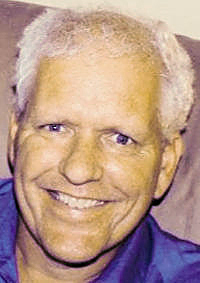 He worked in Design and Traffic, State Aid Federal Projects, Maintenance Operations, and Cooperative Construction Projects. He graduated from the University of North Dakota-Grand Forks in civil engineering. What is the main part of your job? In terms of time, it’s the technical/liaison aspect. I represent maintenance on several committees such as the design advisory committee and maintenance management committees and on task forces for topics such as design flexibility, complete streets and bike design manual. I also review technical memos and policies and am research project technical liaison. I also work with our rest area program manager, contract management and district facility staff on the rest area custodial contract. My unit also has maintenance work zone safety responsibilities and manages the State Sign Shop and Striping businesses. How do you work with different departments? Each of the materials contracts may have a different acquisitions management specialist at the Department of Administration. I worked with the Department of Natural Resources on roadside issues, such as ATV trails and partnership agreements for joint state park and rest area facility custodial services. Currently several of us in the department and Metro District are working with the Minnesota Pollution Control Agency on a Local Road Research Board Research Synthesis Project looking for non-chloride deicers and methods. We’re also working with the Twin City Metro Area Chloride Project led by MPCA to assess chloride impacts in the region and develop tools to help all agencies minimize chloride impacts to surface and groundwater. The office also gets involved with the Department of Public Safety on work zone safety issues, such as speed limits, via the statewide work zone safety committee and 511 winter reporting to State Patrol. 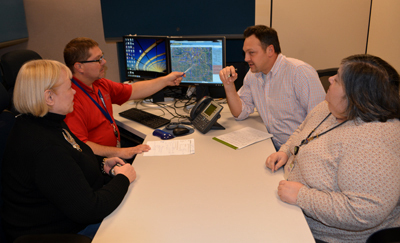 I also assist MnDOT emergency management in staffing the MnDOT desk at the State Emergency Operations Center. I like the variety of topics and being able to help district staff, specialty offices and other state agencies in delivery of the maintenance program. One day I might be working with roadside management issues with district permits staff and land management, and the next day, it’s work zone safety with the traffic office, statewide safety office and district maintenance. We have a great team of knowledgeable and dedicated staff in districts and specialty offices and I’ve had the opportunity to work with many people over the years in different roles and consider many as friends. Keeping the multitude of topics and subject areas organized and tasks on track given ever-changing priorities is a challenge. The liaison role can also be very challenging since it involves bringing ideas from groups with different perspectives together to work on issues. The standards and policy component of my position is one area that is difficult since it involves technical, budgetary, legal and political concerns. So much of what the department does has ties to state statute, rule or federal regulations that it is tough to develop guidance without a thorough review by many offices and potentially multiple revisions. What’s been the most interesting aspect of your job? Everything to me is interesting at some level so the ability to influence so many subject areas might be as good an answer as I can give. I like problem-solving and learning something new every day, whether it’s researching statute, talking to district staff on maintenance procedures and issues, or working with a researcher on an issue. I get the opportunity to work with many staff persons on a multitude of topics and enjoy the personal contacts. The State Sign Shop and Striping businesses are interesting to me since I like equipment and building things. The State Sign Shop at the Metro Oakdale Office fabricates a big portion of the informational “Green Signs” and specialty signs used by Maintenance for statewide sign replacement and they have a variety of fabrication equipment. The stripers are a very large and complex piece of equipment and I really respect the crews that keep them running. The striping business is also involved in the placement and evaluation of new striping “paint” and reflective materials. Beth Petrowske, District 1 public affairs coordinator, created this infographic about the sudden closure of the I-35 Bridge in Duluth. The infographic received an award from AASHTO’s subcommittee on Transportation Communication in September. An infographic about the sudden closure of the Interstate 35 Bridge in Duluth in November 2013 recently received honors in the TransComm 2014 Skills Contest sponsored by the American Association of State Highway and Transportation Officials’ Subcommittee on Transportation Communication. 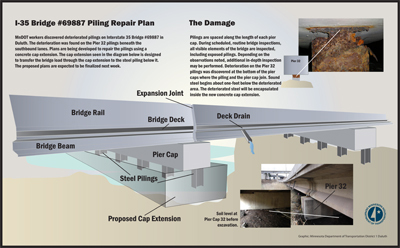 The award recognizes the graphic design work of Beth Petrowske, District 1 public affairs coordinator, who, with the assistance of district engineers, created the infographic to help convey information to the public about the sudden closure of the bridge after a routine inspection discovered deteriorated pilings. The bridge’s closure affected approximately 50,000 motorists daily. AASHTO annually conducts the TransComm Skills Contest to recognize the outstanding work of public relations practitioners and promote an exchange of ideas. The awards were presented in late September during the annual TransComm meeting.